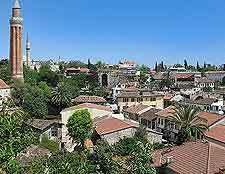 Antalya has plenty of history behind it, with interesting events having occurred throughout its existence. As a consequence, it's been left with a variety of structures, landmarks, monuments and eye-catching locations that are extremely important to its present-day identity. 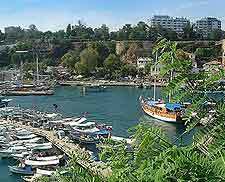 The Fluted and the Truncated minarets are among the best known landmarks in the city of Antalya. The latter, also known as Yivli Minare, is the more famous and striking of the two, and should not be missed. The Old Harbour is one of the city's favourite meeting points for both residents and visitors, making it an important landmark by which to navigate the city. With the numerous hotels, shops and restaurants that fill the area, the harbour is something of a focal point for local leisure activities. On the eastern side of Antalya's Old Town (Kaleici) there are some large portions of ancient wall that date back to both Roman and Hellenistic times. One of the most significant sections is punctuated by Hadrian's Gate, which was built to honour Emperor Hadrian on his visit in 130 AD. The gateway is made from marble, features three arches and is flanked by two splendid towers. 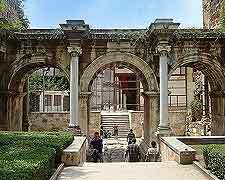 This beautiful landmark is part of a 2nd century AD building that was originally a temple. In the Byzantine period, the structure became a church. 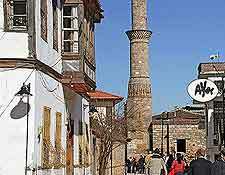 Later still, in the Ottoman period, the Kesik Minare became a mosque. This is when the minaret was added. Despite suffering damage in an earthquake, the minaret retains much of its original beauty. Yivli Minare, also known as the Fluted Minaret, stands an impressive 38 metres / 125 feet high and was constructed originally as part of a mosque commissioned by Seljuk Sultan Aladdin Keyykubad during the 13th century. The minaret, which is popularly considered the city's most striking landmark, is decorated with brown tiles and mounted on a large square base.